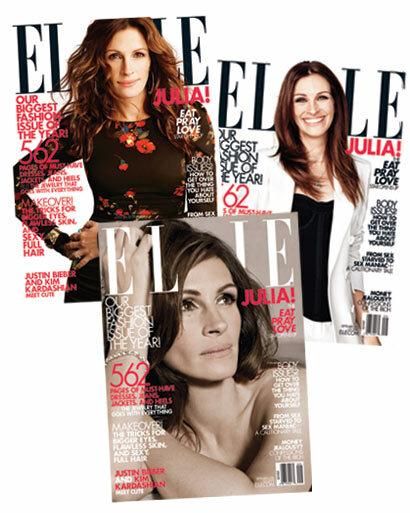 Style Notes | America's Sweetheart, Julia Roberts, graces the cover of Elle's biggest fashion issue of the year. Yes sweet peas, the September issue. Seriously, how could you not fall in love with that face? Julia's look is so fresh and youthful at 43-years-old. But if you think she injects with all sorts of Botox—guess again. Because judging from the Elle excerpt below, she is all natural. On Botox/ The Plastic Surgery Trend in Hollywood: "It's unfortunate that we live in such a panicked, dysmorphic society where women don't even give themselves a chance to see what they'll look like as older persons. I want to have some idea of what I'll look like before I start cleaning the slates. I want my kids to know when I'm pissed, when I'm happy, and when I'm confounded. Your face tells a story ... and it shouldn't be a story about your drive to the doctor's office."